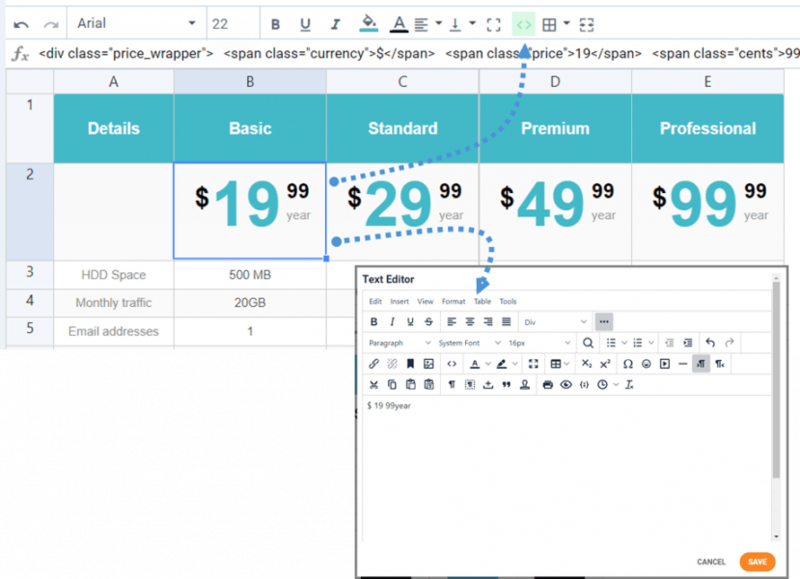 Droptables is a Joomla extension used to manages HTML tables in Joomla with a spreadsheet like interface. When Droptables is installed you have a component entry, menu Components > Droptables and an editor button that is displayed bellow your editor. Click on it to open the main Droptables view. 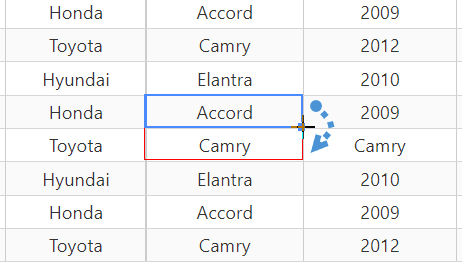 If you click on the area then on the Droptables button again the table previously added will be loaded. Tables are classified into categories. You can have as much tables as you want inside categories. In order to create a table category, click on New table category on the top center. To create a new table just click on the Create table. Note: a default category and table is already created during component install. 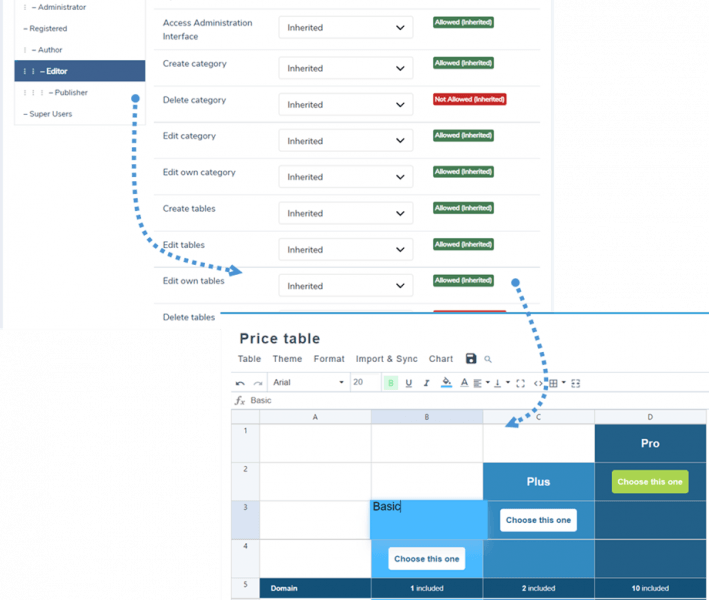 You can move tables and tables categories using drag'n drop. The category can be managed by putting your mouse on it, you’ll be able to edit the name, copy or delete the table. Or use the right click. To copy cells you can use CTRL+C / CTRL+V or you can also put your mouse on the bottom right corner of the cell and bring it into the direction you want. From the right click menu you can undo the latest modifications, all the latest ones since you've reloaded the page. Droptables keeps a backup of the modification you’ve done and is able to restore it. Cells can also be merged. Select 2 cells or more then do a right click. A menu will allows you to do the merging. Now when you edit the cell, you’ll have HTML editor inside. It also include all the editor content button, here I used the image button for example. Editor buttons available are configurable as an option. The tables can be imported from Excel or Open Office. The format will be detected automatically and imported. Note that only the first Excel page will be imported. The export can be done in Excel 2003 or 2007 format. 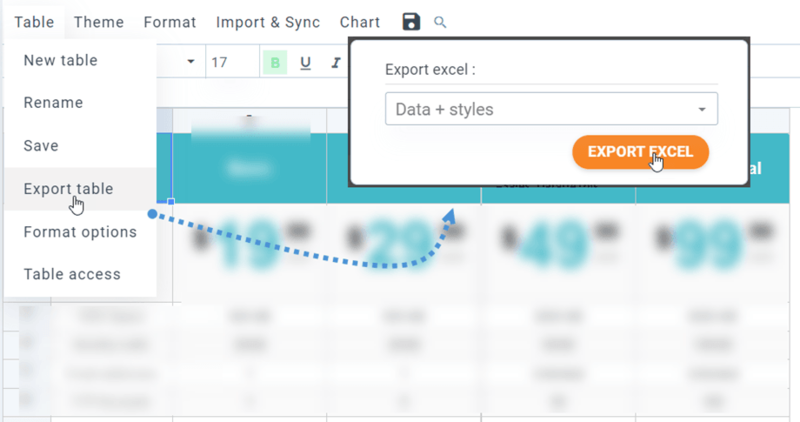 You can also import or export table data only or table data + styles. The import data only is pretty handy to preserve your layout on import. The format tab is available at the right of your screen by default. It contains different styling parameters. Cell type: default or HTML (with editor). The default type allows you to make calculation with it the HTML inserting HTML content like images. The row and column width/height can be defined in pixels. Select column or row anywhere in the table and validate size. A tooltip on cell mouse hover is also available (needs to be activated from component options). On click on the tooltip button you can edit the content visible on cell mouse hover on frontend. On the table tab, still on the right part, you have a thumbnail theme chooser. Just click on a theme to apply it. We highly recommend to apply themes on fresh tables, it’s really easier to change data then. If you already have data in your table and you apply a theme, all data will be removed. 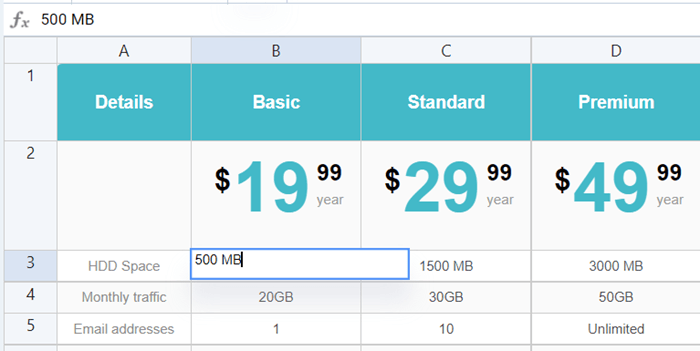 If you apply a theme on a new table, example data and style will be added and can be edited. The sortable parameter allows you to make AJAX data sorting on frontend. Note that if you enable the filter tool, a data sort tool will be enabled by default. The table align is about align the div that contain the whole table, center all the table for example. 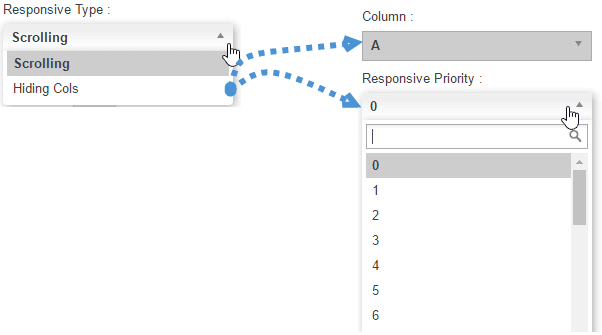 The column and line freezing options will freeze the selection and enable a scroll on the rest. Make my tables responsive or use the scroll on small devices? 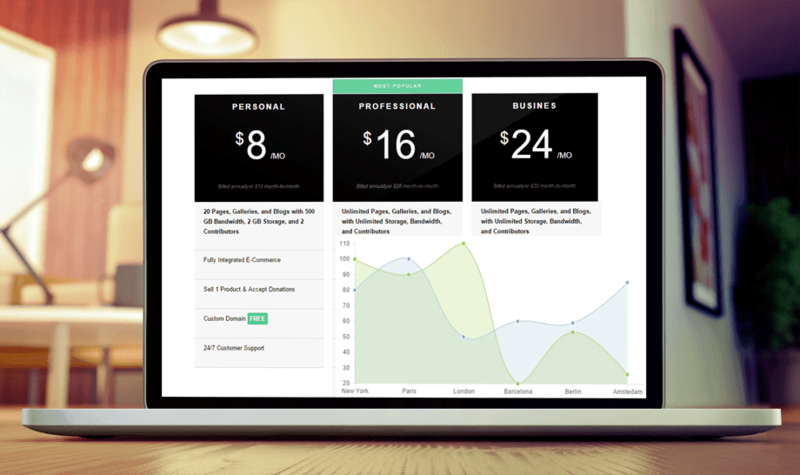 Droptables handle the responsive design with a priority tool, as an option. By default the responsive feature is disabled, there will be an overflow (witch is working great on mobile though). A cell hightlight is also available as an option. You can enable this feature in the configuration. It is disabled by default. You can adjust color and opacity of highlighting. It is possible to manage your tables from the Joomla frontend. 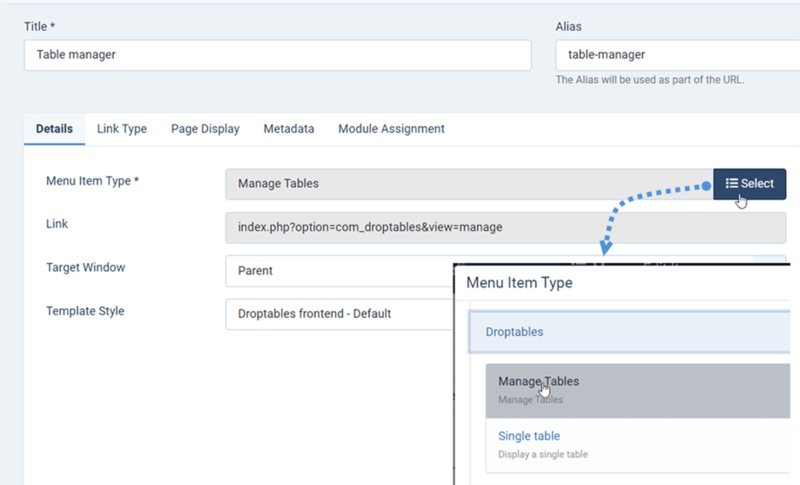 From the Joomla menu manager, add a New Menu item and select as type Manage Tables and select Droptables frontend as template. Here is what you can see Droptables Manager from frontend. Note: To display the table manager interface with full screen on frontend, you should choose Template Style > Droptables frontend. 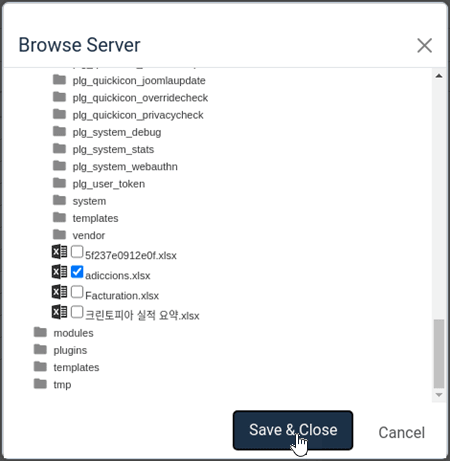 You can use the Joomla User Group ACL to control the table edition actions. First, to setup who is allowed to view tables you need to enable Enable table access (ACL) feature in Droptables configuration. Plus, you can control the table frontend visibity for each table from the table settings (More tab). Pickup a Joomla user group to allow a group to view the table on frontend. Let’s go one step beyond. If you’re a webdesigner with CSS edition skills, you’ll be able to add css from the right More tab. You can add padding and border radius on cell. 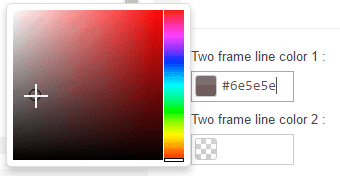 The CSS code is colored using code mirror. The css code can be less code, it works too! You can generate charts from table data, inside your content. First create a table with data to generate chart. 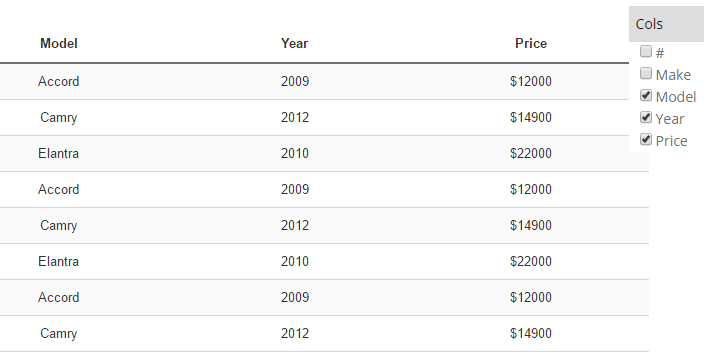 Table don't have to be displayed with the chart in your content and you can generate several charts from a single table. Then make you selection in order to generate chart. Here, all the table is selected. Then click on add a new chart. A chart will be generated, respecting the data range you’ve selected. On the right part you can select the chart type. The graph will be dynamically updated regarding the data change in the table, you don't need to regenerate it. The Switch row/column is only available is you have selected only numbers in the dataset. 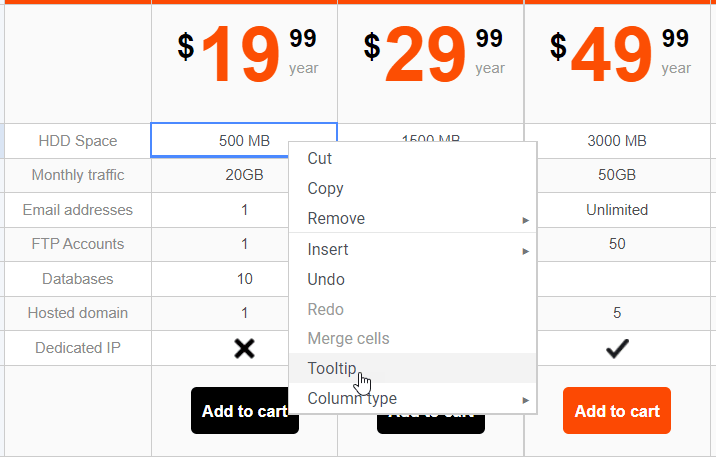 You’ll be allowed to switch data from columns to row. The Use first row/column as labels parameter allows you to add label to your graph. Then you have options to set width/height, align, color of your chart. A Joomla ACL integration is available. You can now restrict access to action or table for table editors. This restrictions applies on all the tables. 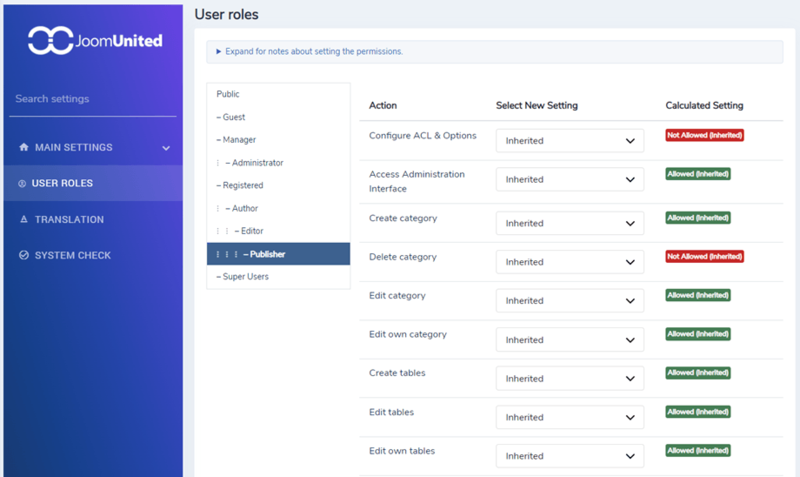 Super admin user will always have all edition permissions for all tables and categories. Droptables is built to be used in every WYSIWYG editor field, you just need to have the content plugin to be called. Most of the time it’s activated by default. If it’s not the case, like in the Joomla HTML custom module, you need to activate it like above. And you can configure the symbol for the cells calculation on number, money or date. On click on the Browse button, you'll be able to select an Excel anywhere on your server, here it's a file uploaded through the media manager (/images folder). Warning: depending of your memory available on your server, you won't be able to import very large Excel files (more than 1000 rows for example). 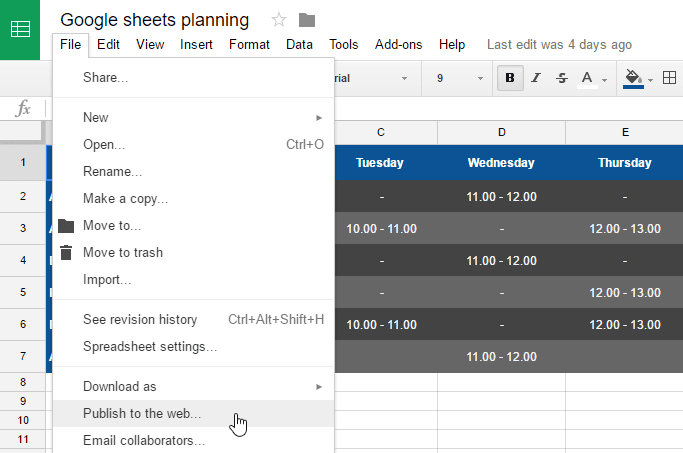 Droptables offers a Google Sheets synchronization possibility. 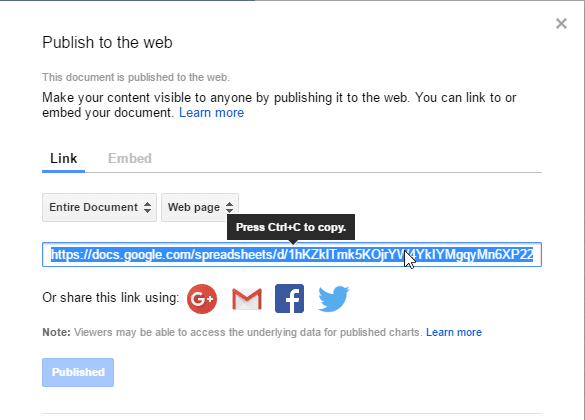 Your Google Sheets need to be "published to the web" to be synchronized. First, open your sheet from Google Drive and publish it as web page using the File menu. Then, you will get access to Google Sheets file link, copy this link. And paste it into Droptables “Table” tab. You're done! 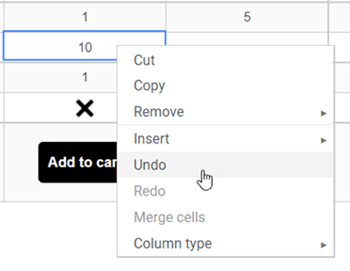 you can now fetch data from your Google Sheets. Above the file link you can also activate an automatic data synchronization. Droptables will fetch the data automatically at a regular interval. The synchronization delay can be set in the Droptables configuration. 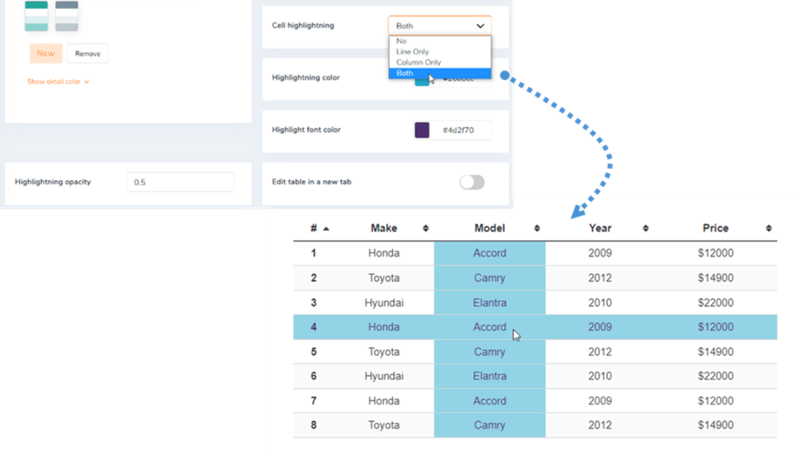 Droptables allows you create tables from your database tables. From the settings of the component, you should Enable database table. Back to dashboard, firstly, you choose Table from database category and then click Create table , then all tables in your database will be listed below. Next, you'll be able to select tables and columns from your database. By hitting control you can select several tables, columns. Finally, you can preview and generate your table like any other table. When your table is generated you will still have access to the table Database source and you can for example add a column in your table. Note: The only difference is that themes cannot be applied on tables but you can customize all the display like in any other table.